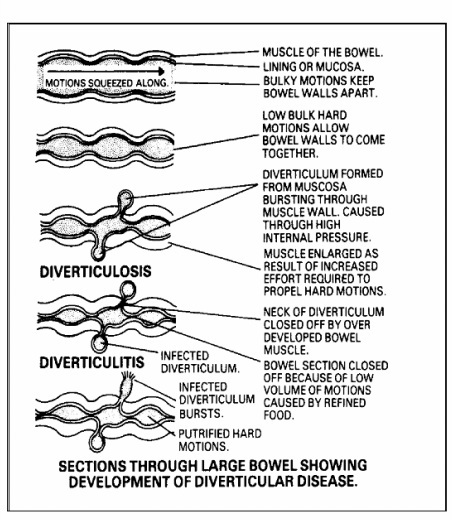 Diverticular disease - The truth about food and medicines. The large bowel consists of circular muscle going round as well as bands of longitudinal muscle. The colon is an organ of bulk and that is why the muscles are in bands so that the colon can expand easily. It has been brilliantly designed. Inside the colon is the lining of the bowel which is called the mucosa. It acts as a kind of wallpaper in the colon. In between the muscles there are holes to let in the arteries and let out the veins which supply the blood to the muscles and mucosa of the bowel. If the pressure rises in the large bowel then the mucosa or lining will be forced through the hole between the bands of muscle forming a balloon which is called a diverticulum. The colon, as explained, is an organ designed for large bulk and it has indentations called septa which, in the healthy person, are well separated by the roughage inside the bowel and this keeps the walls apart. When refined food is eaten then all of it is digested leaving no roughage present and therefore there is nothing to keep the walls apart. The walls come together and the septa touch each other. Once this happens it means that when the bowel compresses, the motions cannot move along because the colon is closed in segments. The pressure then rises to a very high level and a diverticulum begins to form. This happens all over the colon, especially in the high pressure area called the sigmoid colon on the left hand side, which is why pain is often experienced there. If the bowel goes into spasm and has to work hard trying to fnd motions to press on and expel, when there are none there, then it has to work even harder and this results in the condition called spastic colon. Any muscle that has to work hard whether it is through gardening or weight lifting, will become bigger the more it is used. In the bowel the same thing happens and the thickened muscle eventually squeezes the neck of the diverticulum that has formed so much that it becomes completely closed off. ﻿The result is the same as happens in the appendicitis and in the gall bladder but on a smaller scale. The diverticulum becomes obstructed and so becomes stagnant and infected. Ultimately it will perforate with the result that infection sets in on a large scale, it becomes gangrenous and the motions start pouring out of the bowel and this is not compatible with life. Diverticular disease is now regarded as very common and some pathologists say that it occurs in everybody over the age of 65. Some would go so far as to say that it occurs in everyone over the age of 40 in our society if the bowel is closely examined. Many studies have been done all over the world to find out the speed of motions through the intestines. The method is to give the patient a number of markers which show up on X-ray. They swallow these tablets and empty their bowels into a black plastic bag. The bag is x-rayed and the tablets can then be counted showing the time they have taken to pass through the body. In British and American societies it takes something like 48 to 72 hours for the motions to pass through. In some cases it takes three weeks and very exceptionally as long as three months. In sharp contrast to this the average transit time in native populations is 12 to 18 hours. Often patients deny that they are constipated but in fact with such hard motions present all they are doing is ‘shunting trains along’. Diverticular disease is a disease which is completely new to the 20th and 21st centuries. It is the direct result of removing the fibre and natural roughage from our food. Patients with diverticular disease often go on to get cancer and this raises an important question. Why should there be this link? When people live on a refined diet it has been shown that the type of bacteria in the intestines is changed. They are changed from healthy aerobic bacteria, that is bacteria which breathe oxygen and incidentally do not produce an offensive smell, to anaerobic bacteria, that is bacteria that do not breathe oxygen. These bacteria have a peculiar property as they can degrade the bile salts chemically to a cancer-producing chemical. The chemical that the bile salts are reduced to is called 20-methylcholanthrene which is the most potent cancer-producing chemical known to man today. When people live on refined food this cancer-producing chemical is actually made by the body. ﻿Cancer is not a roulette wheel nor is it just chance,﻿ it is the result of broken physical laws. While diverticular disease is the mechanical manifestation of a refined diet, cancer of the bowel is the chemical manifestation. Most of the cancers occur in the sigmoid colon because this is the reservoir area where there is most stagnation. The same experiment of investigating the motions and their bacteria has been done all over the world, in Polynesia, Africa, India and other parts of Asia, to determine the nature of the motions. It was found that Africans and Asians who live on traditional food do have aerobic bacteria in their bowels while we in the West have dangerous anaerobic bacteria as a result of our refined diet. This is a most important fact because it demonstrates how to avoid cancer of the bowel. The message is filled with hope for the future if only people will take note and change to an unrefined diet.